Before deciding which method to use for data synchronization, several solutions have to be evaluated. Based on this we can decide which one best satisfies our demands. The first thing to look for is a complete working solution that already provides synchronization with various data sources. When it comes to the terms of synchronization software, the first one to mention is Starfish‘s TrueSync platform. Starfish is a company that was founded in 1994 in California. It started out with a simple desktop organizer software but soon went over to address data synchronization problems. Its main product is the TrueSync platform. This platform can be adopted to almost every PIM client, and many PDAs. In 1998 Starfish even started creating an own server software. Starfish was also a founding member of the SyncML initiative. Since all their products are based on the same TrueSync platform, they could easily be adopted to the new SyncML platform. Many vendors of small devices now licensed this software for use in their own devices. The Starfish TrueSync platform is probably the most widely used in current handheld devices. Figure 3.1. How starfish sees its own products. Starfish TrueSync addresses all mayor issues in synchronizing data across PIM devices and desktop-based solutions. It works with the most common used organizer programs such as Microsoft Outlook and Lotus Notes. It also works with all PalmOS based PDAs, all Motorola cell phones, and many others. There are two ways TrueSync supports a product: The manufacturer can license the TrueSync software directly. The TrueSync platform is then adapted for this particular device. The second way is by adding an apdapter which translates the device specific commands to TrueSyncs own protocol. 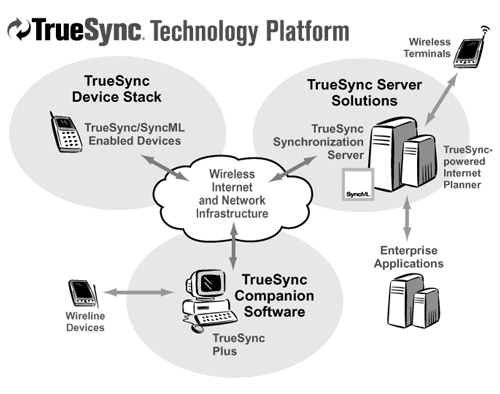 But TrueSync does not only support client devices. There are desktop based solutions called TrueSync Plus, TrueSync Express, and TrueSync SDK. TrueSync Plus is a Personal Information Manager software. It supports the standard features for a desktop PIM software, such as calender and address book. TrueSync Express is just the adaptor between the TrueSync Protocol and existing PIM Software, such as Lotus Notes or MS Outlook. TrueSync SDK is a sofware development kit that can be used to adapt an own software to the TrueSync Protocol. To complete its software spectrum, StarFish also offers server solutions and even an Internet Planner to store and access the data. For communication between the different software parts StarFish uses either a proprietary TrueSync protocol or the newer SyncML protocol. This enables the software to interoperate with all other SyncML conform applications and devices. So why not just use TrueSync? It has everything that one could possibly want. The answer is a question of money: Starfish currently does “not sell directly to end users or in small volumes”. This makes it difficult if not impossible for an end user to actually use this product.